All school buses will be running about 5 to 10 minutes behind schedule today! There will be baseball practice today from 1 - 3 pm. 12:50 pm Release for Conference Week - reminder that school ends at 12:50 pm all week. Contact your student's teacher on Monday if you haven't scheduled your conference yet. Online parent/teacher conferences link will close at 3 pm on Thursday. Make sure you sign up before then or contact your student's teacher or the school office. Zumba tonight at 6:30 pm in the multi-purpose room. Come move and have some fun with the family! Band Concert Tonight at 6:30 pm in the multi-purpose room. Hope to see you there! Have you signed up for Teacher Conferences? Go to www.uniongapschool.org and click on this link on the picture banner of the website. Yakima Valley Libraries Present: Y/Our Story tonight at 5:30 pm at the downtown branch (Central). Community conversation about race and racism in Yakima. No child care provided. Art competition for specific 6th - 8th graders is canceled for today and will not be made up (Prosser School District is closed today). Conferences are coming up soon and the sign up link is now available on the district website at www.uniongapschool.org (Sign Up For Conferences Here!) in the picture banner. You also have the option of signing up for a time to meet with Specialists at a time of your choosing! Spring Sports Postponed - the first day of spring sports (girls soccer and boys baseball) have been postponed to begin Monday, March 18th due to snow on the fields. There will be no practice this week. No School Tomorrow (Friday, March 8) for teacher professional development. See you Monday! Due to adverse weather, after school ELL program is canceled for today. Remember Dr. Seuss Family Night is tonight at 6:30 pm. The Book Fair will be open in the Library as well. We hope to see you there! There is school tomorrow (Friday, March 1)! Sorry for the confusion. 2-hour delay for school today (Thursday). School will start at 10:30 am. Buses will be on snow routes this morning. No breakfast will be served. Dr. Seuss Reading Family Night is tomorrow night at 6:30 pm in the multi-purpose room. The Book Fair will also be open. We hope to see you there! EPIC is registering for next school year. Call (509) 834-0945 for more information. School is open and on time today (Monday, Feb 25). Buses are on normal routes. Parents - please have your students look in the lost and found for any missing coats and sweaters. Any coats and sweaters left after March 1st will be taken to be donated so make sure to get your coats and sweaters before end of next week. No School Tomorrow in observance of President's Day! School is open and on time today with early release at 12:50 (Friday). Due to increased adverse weather, we are cancelling after school programs, including HUGS and sports practice today. All students will be coming home at their regular dismissal time. Tonight is McTeacher Night at our Union Gap McDonald's from 4:30 - 7:30 pm. Come and get served by school staff! Reminder - Class Pictures Tomorrow! Free Dress Day! The office does not have change for picture costs. The Union Gap School District will have a two-hour delay, buses will be on alternative snow routes- classes will begin at 10:30 am. NO breakfast will be served. We are closing the office a little early today due to worsening weather. Thank you for understanding. We are on snow routes this afternoon for busing. After school sports practices have been cancelled today. All after school programs (sports and ELL) are cancelled today (Friday) due to incoming weather. Valentine's Day - Family Night tonight at 6:00 pm - 7:30 pm in the Multi-Purpose Room. Hope to see you there! Parents - school does not open daily (when on time during winter months) until 7:45 am. There are no adults on duty until this time. It is too cold for your students to be waiting outside for the school to open in this weather so please do not drop them off prior to this time. School is open and on time today (Wednesday)! Union Gap School is closed today. No sports practices after school today due to weather. The girls' basketball game is cancelled for this afternoon. Highland does not want to travel to UG due to road conditions. 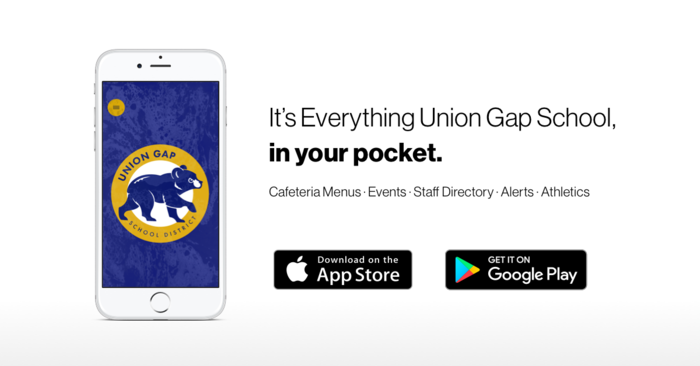 We’re thrilled to announce Union Gap School District’s new app! 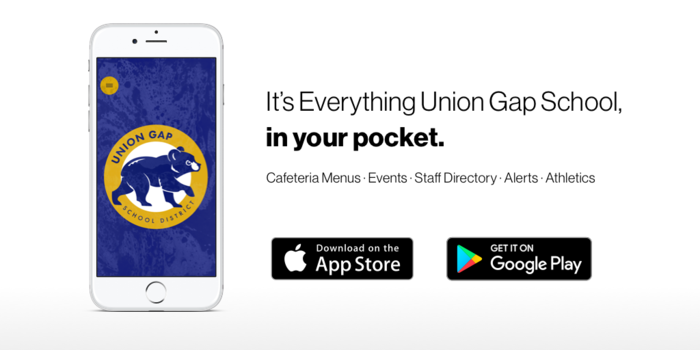 Access sports scores, cafeteria menus, news updates, even emergency notifications! Download the app on Android: http://bit.ly/2IPb8Mk or iPhone: https://apple.co/2FIUJeo. Due to road conditions, the Wrestlers will not be traveling to Cle Elum for their game today. Due to worsening road conditions, we are on bus snow routes this morning. English Language Proficiency testing is all month for those students that are identified. Parents have been notified this year if your child qualifies. School resumes January 7th! See you then. Band Concert Tonight! 6:30 pm in the multi-purpose room. Por favor note que vendemos prendas de vestir del uniforme escolar a un costo. Nosotros sumamos el costo que pagamos por los artículos, junto con estampilla, y después lo redondeamos al dólar más cercano. Las prendas de vestir de los uniformes no son una recaudación de fondos para el distrito escolar. Please note that we sell school uniform apparel at cost. We add the cost we pay for the items, along with postage, and then round the overall cost to the nearest dollar. School uniform apparel is not a fundraiser for the school district. 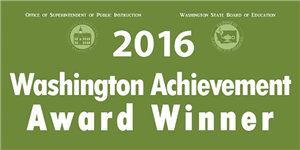 The Union Gap School District recently received the 2016 Washington Achievement Award, which is sponsored by the Washington Office of Superintendent of Public Instruction and by the Washington State Board of Education. Our District is seeking applications from qualified individuals to fill the vacant school board director position for District #1.